The ethnically diverse regions of the north-eastern India (collectively accounting for 8% of the geographical area and about 4% of the population) is known more for tribal and ethnic insurgencies. That dubious distinction is earned despite the region being given distinct political & legal protection by independent India. In fact, the region has scarcely integrated with mainstream India. Restrictions have been in place on Indian nationals from acquiring land in the regions protected by the Inner Line Permit System. While Arunachal Pradesh, Mizoram and Nagaland are protected by the system, the valley regions of these states are virtually unprotected by the assault of migrants from neighbouring Bangladesh. Government sponsored efforts to direct development in the region through the North East council, and even separate Five Year Plans, have succeeded in creating only a skewed economic structure. Differences exist among the â€˜Seven Sistersâ€™ with respect to resource endowments, levels of industrialisation, and also agricultural development. As a result, the region has not been able to produce enough food grains to feed its own population, thus importing food-items worth Rs.250 million annually. 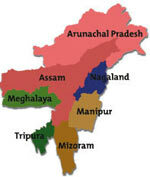 North East would continue to simmer, unless the government focuses on a simple fact. Development!